Dhaka, Apr 3 (Just News): BNP today alleged that the ruling Awami League opened 25 news portals to spread fake news. On the basis of the AL supported news portals’ reports to tarnish the image of the party the Anti-Corruption Commission (ACC) has started investigating against the BNP leaders’ bank accounts, the party claimed. “BNP Chairperson Khaleda Zia was sent to jail in a false case. Although she secured bail from the High Court, her bail is lingered in the pretext of different causes. Party’s acting chairman Tarique Rahman is abroad. Party’s secretary general Mirza Fakhrul Islam is admitted to hospital,” Khandakar Mosharraf Hossain, party’s standing committee member, told journalists at a press briefing at party’s Nayapaltan headquarters in Dhaka. “In such a situation, false and fabricated news published against BNP leaders and ACC’s announcement of enquiry is nothing but an attempt to tarnish the image of the senior leaders,” he added. The BNP leader alleged that the government is spreading fake news against the BNP leaders to keep them away from the politics but the government’s such “evil” attempt will not work. 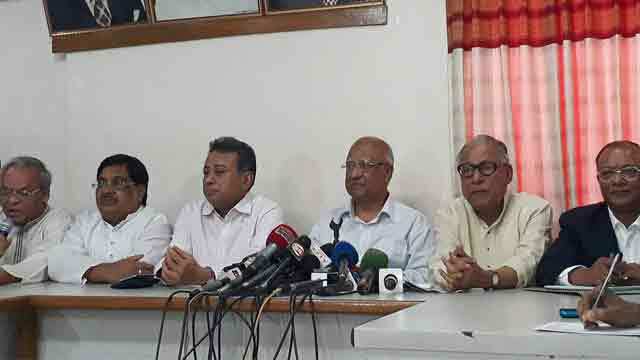 BNP’s standing committee member Nazrul Islam Khan alleged that the government has given order to the ACC to take steps against the persons to keep them away from movement. “ACC claimed itself as an independent body but it acts as an arm of the government,” he said. The BNP leader said none has the right to say or write anything against anyone on online news portals. “We have families and relatives. We came to today’s position after a long struggle. I will say either they (online news portals) should seek apology or we will consider to take legal actions against them,” he added. Party’s another standing committee member Amir Khosru Mahmud Chowdhury alleged that the government is trying to mislead the nation through falsehood. “Awami League has opened 25 fake news portals. These news portals are their regular falsehood,” he said. He alleged that the government has destroyed the organization like ACC by politicizing.